This most unusual name is of Anglo-Saxon origin, and is a topographical surname for someone who lived by an "oak-covered headland", or "at the end (head) of the ridge of oak trees". The name derives from a contracted, Middle English, form of the Olde English pre 7th Century phrase "acheafod", from "ac", oak (tree), and "heaford", head (land), upper end, summit. Topographical surnames were among the earliest created, since both natural and man-made features in the landscape provided convenient and easily recognised distinguishing names in the small communities of the Middle Ages. An early example of the surname is that of Johannes de Aykehened, recorded in the Poll Tax Returns of Yorkshire of 1379. 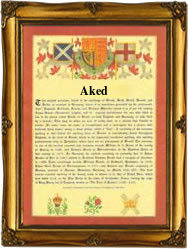 The modern surname can be found in a variety of forms, ranging from Aked, Akid and Akett to Akitt and Aikett. Yorkshire Church Registers record the christening of Richard Aked at Ryther, on April 12th 1609, and the marriage of Tristram Aked and Hester Booth on August 13th 1646, at Bradford. The Coat of Arms most associated with the name depicts, on a fesse between two cottises red three white fleurs-de-lis, on a white shield. The first recorded spelling of the family name is shown to be that of Richard de Aykeheved, which was dated 1280, in the "Chartulary of the Abbey of Rievaulx", Yorkshire, during the reign of King Edward 1, known as "The Hammer of the Scots", 1272 - 1307. Surnames became necessary when governments introduced personal taxation. In England this was known as Poll Tax. Throughout the centuries, surnames in every country have continued to "develop" often leading to astonishing variants of the original spelling.